Clinical research is important. Unless we get involved in research we won't be able to answer vital questions about the right treatment for our patients. You may be asked by the clinical staff treating you to take part in a clinical trial or research study. 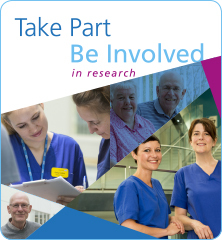 Many patients voluntarily take part in research as ‘participants’. Taking part doesn’t always mean being prescribed a new medication. It can involve providing urine/blood samples, completing a questionnaire, or simply a researcher asking about your treatment and experiences. Clinical trials and studies recruit many participants, but participants have to fit guidelines - eligibility criteria. These criteria may concern the type of disease, history, age, gender, etc. They may need to be very specific to ensure people who take part are not exposed to avoidable risks. Even though you may be interested in taking part we have to be sure you fit the narrow criteria for that study and are eligible. To take part in a clinical research study, speak to any of our health professionals to see if you are eligible.